COLUMBIA, S.C. – The South Carolina Department of Public Safety partnered with local hospitals, first responders, and law enforcement agencies across the state today to launch the annual Sober or Slammer! impaired driving crackdown, which begins August 15 and runs through the end of Labor Day. The campaign includes high visibility enforcement and public education efforts aimed at curbing collisions and fatalities as summer wraps up. Since Memorial Day, 141 people have died on South Carolina roadways in traffic crashes, which is down from last summer when there were 168 people killed during the same time frame. Overall traffic deaths on the roadways are down by 17 compared to last year. As of August 13, 437 people have died on South Carolina highways, compared to 454 highway deaths during the same period in 2013. Of the 311 motor vehicle occupants who have died in 2014, 154 were not wearing seat belts. The latest DUI statistics show that 348 people died in 2012 as a result of an alcohol-involved crash. For the SOS campaign, increased DUI enforcement will be coupled with SCDOT’s message boards that will display “Statewide DUI Crackdown in Progress” bulletins, urging the motoring public to report drunk drivers by calling *HP or *47. The message boards have already been used on designated DUI enforcement weekends during the summer. 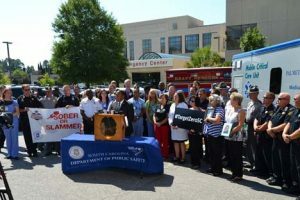 SCDPS also will use television and radio commercials, billboards, social media, and alternative advertising, such as anti-DUI warnings on ice boxes, gas pump handles, and box trucks to get the message out. Last year, law enforcement officers in South Carolina, including troopers, made more than 27,000 DUI arrests. SCDPS’ Sober or Slammer! campaign is part of the national Drive Sober or Get Pulled Overcrackdown coordinated by the National Highway Traffic Safety Administration. The effort includes state and local law enforcement agencies across the country. The campaign combines high-visibility enforcement with heightened public awareness through advertising and publicity. SCDPS also encourages the public to join the Target Zero conversation and let us know what you, your family or organization is doing to make our highways safer by posting to social media and including #TargetZeroSC.